Inside: … Hope you get to splurge on something fun! Have a Happy One! Inside: Hope Valentine's Day makes your hearts purr with happiness. More Info: Glitter on the whiskers and heart, gold foil lettering, and a gold foil heart highlight this wonderful illustration. 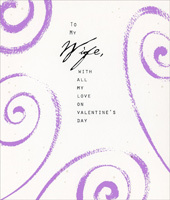 More Info: Purple foil lettering and embossed (raised up) images are featured on this wonderful Valentine's Day card for daughter. Made in USA. Inside: A very special Valentine's wish for a very special daughter Happy Valentine's Day! Front: I'll always be your girl, Daddy! Inside: We may not always have it all together, but together we have it all. More Info: Features purple foil swirls. No additional postage is necessary when mailing this card. Made in USA. More Info: Two die cut windows reveal the gold foil portion of the interior image of this Valentine's Day card for someone special. Printed on recycled paper. Made in USA. More Info: Two die cut windows reveal the gold foil portion of the interior image of this Valentine's Day card for your sweetheart. Printed on recycled paper. Made in USA. More Info: Light pink and orange flowers serve as the background for this unique Valentine's card that features another piece of floral artwork that has been attached to the front of the card, floating above the card's front panel. Red foil lettering and a gold ribbon and bow enhance the card even further. Additonal postage required when mailing this card. More Info: Features red foil lettering and red foil accents throughout the heart illustrations. Printed on Recycled Paper. Made in USA. More Info: Embossed ribbons and a shimmering red foil heart make this simple illustration one of beauty. Printed on Recycled Paper. Made in USA. More Info: Red and green foil make this card shine as light reflects off the embossed illustrations. Made in USA. 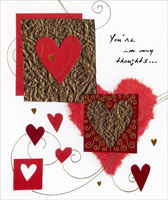 More Info: Bright red foil and an embossed heart illustration are featured on this Valentine's Day card. Made in USA. More Info: Features gold foil swirls, and small gold foil hearts. No additional postage is necessary when mailing this card. Made in USA. Front: On the road of life.. 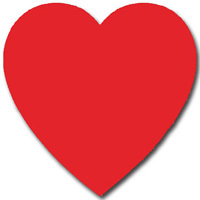 Inside: Want to make sure that you get this on time 'Cause Cousin, you're one of my favorite Valentines! 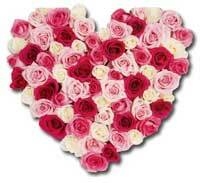 Have Lots of Fun on Valentine's Day! More Info: Features black foil lettering and black foil lines throughout the front image. Made in USA. Front: Happy Valentine's Day to my Wife - When I count my blessings.. Inside: I count you twice! I love you. I love you. More Info: Simple touches of gold foil in the roses, hearts, and swirling border are a nice touch on this Valentine's Day card for someone special. Printed on Recycled Paper. Made in USA. 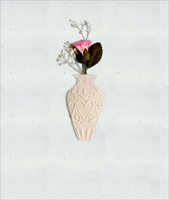 More Info: This Valentine's Day card features an actual miniature pink rose inside an embossed vase. The rose and vase float off the page, creating a wonderful and truly unique design. No additional postage is necessary when mailing this card.